The main sights people usually visit in Baku are in downtown. These are the places like: the Fountain Square and Nizami street (formerly known as Torgovaya street), Maiden Tower (12th century), Shirvanshah's Palace (approximately 15th century), old city fortress walls (11-12th century) and other sights inside these walls (old hamams, karvansarays and etc), beautiful architectural buildings built during first oil boom (late 19th century) on Istiqlaliyyet street, old philharmonic building and philharmonic park, old governor's park, very beautiful mountainous park (former Kirov park) from where you'll see the whole curve of Baku bay, the martyr's alley above mountainous park, funicular railway (between mountainous park and Azneft square) and the seaside boulevard park (established in 1909) which runs for 4 km in length (in a few years, it is expected to reach 26 km after connecting the whole bay). Defense fortress in Ramana district built supposedly in 14th century, can be seen from all neighbouring settlements as it is situated on a very high hill. It is in a square shape and the walls are about 8 meters in height. Height of the central watch tower is 18 meters. You can ask the keeper to unlock the gates if you want to walk up on to the tower to see surrounding settlements. It's in about a 30 minute ride from downtown. The square (14th) and round (13th century) watch towers in Mardakan district (30 minute ride from downtown) are not as huge as the Ramana fortress but deserve a glance too. Aside from being watch towers, their walls give an idea that they were used as a shelter for people of the district to hide during wars. The round tower has no keeper and is unfortunately completely abandoned (a few months ago when I visited that place) but the square one has a keeper who will show you what's inside. They are situated in a 5-10 minute ride from each other (you can easily get lost because of too many turns and dead-ends). Defense fortress in Gala district and the new ethnographic museum beside it (about 30 minute ride from downtown) is definitely worth visiting. The fortress itself as compared to the previous two has been restored as it was seriously damaged decades ago. Nevertheless, despite the new walls, its basement has tunnels which lead to Caspian bay and supposedly to downtown of Baku, somewhere nearby Maiden Tower. The archaeological works couldn't be properly performed due to many new houses and settlement build on Absheron peninsula (it wasn't safe to dig under every house to see where the tunnels lead, but there are proofs that settlements in ancient Baku were connected via underground tunnels system). Gala is the oldest settlement of Baku and excavation works prove that life in here dates back to 5000 years. There are lots of ancient remains on its territory. The museum itself will give you an exemplary idea of how people lived here centuries ago (the are old houses, kitchens, wedding halls, water wells, a smithy and etc.). 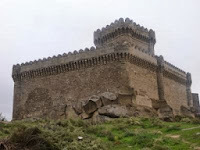 Defensive fortress in Nardaran settlement (about 40 minute ride from downtown) was built in year 1301. Although despite being named a defensive fortress, there are assumptions that it is just a watching point and a stay-rest point for people passing by because it is located not so close to Absheron borders and the seashore. There are also defensive fortresses in Shaghan and Bilgah districts too. The one in Bilgah district used to serve also as a lighthouse for centuries. But unfortunately both these fortifications didn't remain well to our days and you'll find only their ruins if you visit them. So, I don't really recommend it because it would be a waste of time. Gurgan lighthouse nearby Pirallahi (formerly Artyom) island was built in 1859 and remained to our dates in a perfect condition. It is 25 meters in height and its light is visible from a 38 km distance. It functions up to date and has a keeper who unfortunately won't let you in most of times (some people managed to get in). It is in a 50 minutes ride from downtown of Baku. Amburan lighthouse in Nardaran settlement (about 40 minute ride from downtown) is a two storied building with a tower built in 1884. There is no certain information if it is functioning now. But I've heard that its tower has been locked for a few years already. Lighthouse in Shuvelan settlement is in about 40 minute ride from downtown, near Caspian seashores. Still, there is not much information about it. All I've heard is that it was not built as a lighthouse. It was a hospital or something similar built in late 19th century by Russians and a lantern was installed on its roof in 1907. 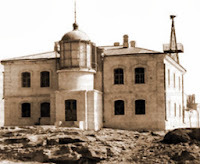 Lighthouse of Nargin (now Boyuk Zira) island began functioning in 1884. 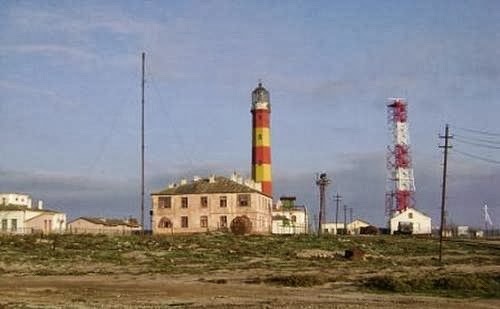 It was partly blown up in 1941 after an order of Soviet military because an air defense unit of Baku was placed on the island and its light might have been useful to enemy planes as a conspiracy. It was reestablished in 1958 and functions up to date. Its light is visible from a 30 km distance. 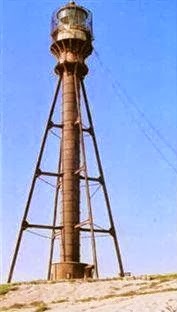 Lighthouse of Sanghi Mugan (Svinoy) island is well known for being designed and built in 1891 in France, following the drawing of the engineers who designed metal towers like Eiffel. 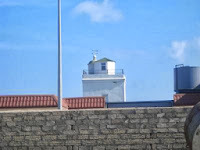 The lighthouse was not a traditional brick-stone building but an iron pipe which was 50 meters in height. Unfortunately, during an eruption of a mud volcano (which the island was rich with), the pipe was damaged by a 150 meter high gas fountain. 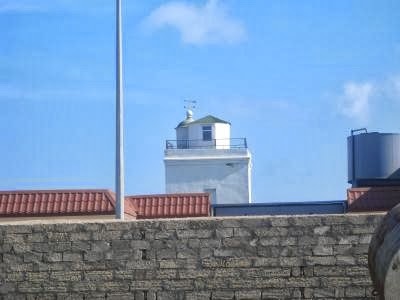 As a result, it led to replacement by a modern electronic lighthouse. This island is slightly far from Baku, in southern direction. 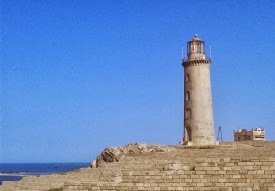 Lighthouse of Chilov island. I couldn't find any information about this lighthouse. All I found out was that it was built in 1873 by the Englishmen. Another interesting fact is that the Maiden Tower in downtown of Baku was used as a lighthouse for many years until 1907, when the city became too big and problem with its visibility began to arise. 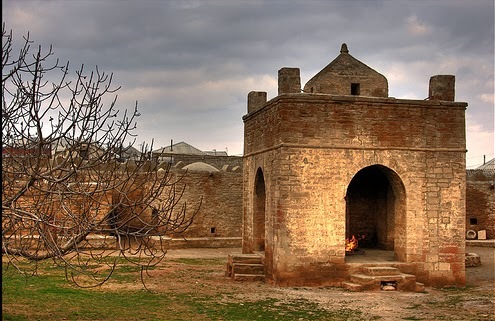 "Ateshgah" (fire temple) in Surakhani district of Baku is an ancient religious structure of fire worshipers This castle-like place has been described by many foreign travelers and historians. It is one of the sacred places Zoroastrians (fire worshipers) used to visit and still do during their pilgrimage. It's in a 25 minute ride from downtown. 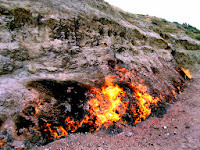 "Yanardag" (burning hills or burning mountains) is a hillside on Absheron peninsula well known for a continuous natural gas fires. Unlike mud volcanoes of Absheron, Yanardag is not a periodic eruption. Steady fire of subsurface gas flows have been witnessed here for many years. It's in about a 40 minute driving distance from downtown but bad roads can make it longer. The best time to visit this place is in a few minutes before dawn. It is also known as a place fire worshipers used to visit during their pilgrimages. 1) Very beautiful German "Erloserkirche" Lutheran church (28 May street / downtown) built in 1899. It has an organ and a bell which were installed since very first day. It has a unique Gothic design. Unfortunately back in early 20th century, its pastor and other members of Lutheran community were executed by Stalin's firing squads. 2) Russian Orthodox Church of Michael the Archangel built and in 1850. It was founded by Caspian flotilla so it is also known as the Church of the Fleet. 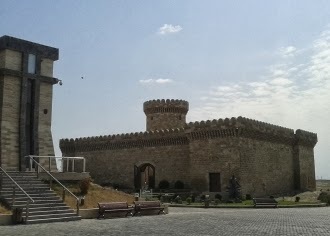 It is located in central Baku, on Zergerpalan street, close to old city walls. 3) Holy Myrrh-bearers Russian Orthodox Cathedral (Qirmizi Sherq 126) in a 10 minute drive from downtown. It was built through personal donation in 1908 - 1909. In 1920 though, it was closed down by the Soviet regime which followed being used as a warehouse. 4) Cathedral of the Nativity of Mary is located in downtown near 28 May subway station and Baku railway station. It was built in 1896 through donated funds but as soon as the Soviet regime was established in Baku, it was first demolished and rebuilt in the nearby street in 1925 and later completely shut down and used as a military barrack. The current address is Shamil Azizbeyov street 205. 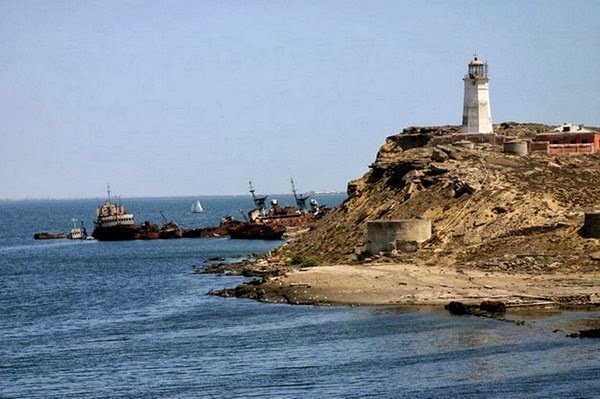 Death island Nargin (now Boyuk Zira) is well known for its old lighthouse. But very few people remember that this island has been the "Siberia of Baku" for many years, where political prisoners and many more accused by the Soviets for conspiracy would be sent for later execution. Even before the Soviet regime, when Baku was controlled by forces of Russian Empire and Great Britain, this island was a prisoner camp for soldiers of the Ottoman and Kaiser armies fighting in the first World War on Caucasian front lines. Majority of prisoners were Turkish soldiers (more than 10.000) who died of famine, diseases and execution. Some however, managed to escape this island. There are rumors that after WWII period when this island was mainly a military base, soldiers and civilians would find mass graves while construction of new buildings. Another rumor is that on the seabed near its shores, there are still remnants of people in chains. So, along with the lighthouse, you can also find some old Russian military barracks, prison cells and a ship cemetery (very old and rusty half-drowned vessels) on this island. Its shores are also said to be very good for fishing and swimming. The problem is that there is no public vessel to reach this island. The only option is to find a private yacht which itself is also not that easy. There are very few people who can agree to give you a trip to that island and back and usually the price is quite high. Plus the yacht owner must be in "friendship" with certain people because as an ex-military base, this place is not supposed to be "open" for civilian visitors. 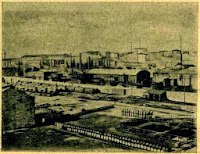 Black city is the name given to southeastern neighborhoods of Baku in late 19th century due to birth of an industrial center in this particular area. By the end of 19th century, this place already included 123 oil refineries, 118 industrial businesses, new factories and many more as a result of the first oil boom. The area itself was not too far from central Baku although the living conditions here were unbearable due to constant smoke and soot in the air. In his book "Banking On Baghdad" (page 100), Edwin Black writes about a young Turkish man who in 1890, traveled a long way from London to Baku and described the black city in his journal: "Everything is black, the walls, the earth, the atmosphere, the sky. One feels the oil, breathes the vapors, the acrid smell seizes you by the throat". Interesting moment is that industrialization led to foundation of a unique architecture in this particular area. There were factories and houses built in a style that would remind you of Europe, with "red bricks" playing a vital role. Unfortunately, 21st century brought an unfair attitude to this place and according to the new design of Baku, old constructions on this area are being completely demolished and replaced with fancy glass buildings, shopping malls, business centers and parks. This process has led to massive construction which can be witnessed today. Instead of turning this area into a huge open-air history museum of the first oil boom in Baku, it was decided to rename this place into "White City" and give a start to a massive construction process. Nevertheless, it is still possible to come up to old buildings which survived up to date but probably won't be there in the next decade. Among those are: a house built for chief engineers of Nobel company (built in 1911), fire station built nearby this house, summer residence of Alfred Nobel (which is a private business club now and can not be visited unless you are member), a building with huge windows which during oil boom period probably served as a factory or a warehouse and a few more. Soon I will include a Google map of black city into maps page with indications of buildings of Nobel era. It is not only the ugly blocks of 9-storied buildings that Soviets built during ages of their rule. When hearing about Soviet architecture, most people think of ugly concrete buildings built mostly during late 70's and 80's, with 7 or 9 floors and tiny rooms in each apartment. Construction process by Bolsheviks made its baby steps with classic (and sometimes even gothic) Stalinist architecture. This was long before the last two decades of Soviet Union when a strategy of "providing every family with its own apartment" (even if was unbearably small) was in agenda. 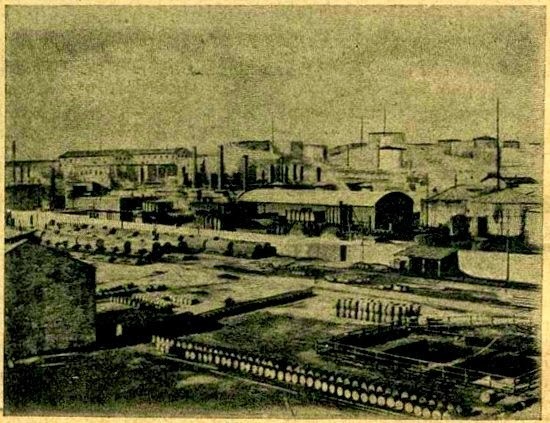 From early 30's until 1955 (approximately), new urban areas (in stead of old village-like settlements) were being built in Baku not far from downtown and the old city. One of these areas was the highland of Yasamal, which was mainly filled by old small houses and a cemetery. In late 50's, it turned into a huge district with new avenues, universities, institutions and houses (built mostly for teachers and professors) that represented the Stalinist architecture. Apartments in these houses (mostly 4 or 5 storied) were quite big, comfortable, with high ceilings and a central heating and sewage system. Exteriors of these buildings were decorated with ornaments and wide balconies. Up to date, the majority of these buildings have survived very well to show us the Stalinist architecture. The main area (Yasamal district) where you can witness this architecture is close to downtown. Personally, I recommend taking a ride through 3 avenues, starting from Inshaatchilar avenue after Bakhikhanov bridge (in front of Hyatt Hotel), then following up to Huseyn Javid avenue and finishing the trip with Parliament avenue, where you will reach the Martyrs' avenue, Mountainous park and the new fancy Flame Towers (from this point it will be a 10 minute walk to reach downtown, or you can take a ride on the funicular). Among the buildings on these avenues are: Baku State University (biggest university in Azerbaijan) and its dormitories, Technical University, University of Architecture and Construction, several scientific Institutions, State Academy of Sciences, State Customs Committee, Ministry of Justice, Ministry of Ecology and Natural Resources, Ministry of Taxes, Ministry of Defense, Ministry of National Security and the Parliament. All these buildings are situated right nearby each other on avenues driving through which takes only 5-10 minutes. Please check the maps page for the route through these avenues. PS: Recommended time for traveling through these avenues is the early evening hours. First due to less tensed traffic and secondly, streets' and buildings' illumination generally gives a nicer picture.